Why should people buy and read Christ’s Team? 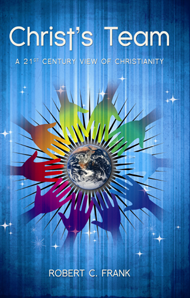 The book is an explanation of Christianity as it exists in the world today and tells why and how Christians are trying to help all people lead better lives. Why is science mentioned so often in the book? Science has been an important aid not only for the relief of suffering but for the spread of the gospel. There would be no personal copies of the Bible without the aid of science and technology. With improvements in communication, Christianity has spread over the entire earth. Christ’s Team isn’t mentioned in the Bible, is it? In the 12th chapter of the Apostle Paul’s 1st letter to the Corinthians, his description of the Body of Christ is an excellent understanding of the teams in our current world. It emphasizes that all members of a team have different views and skills but work together and depend on each other. The book discusses God’s continuing creation. What is God creating? It is estimated that approximately 360,000 new people are born on earth each day and the lives of most people are continuously improving. It appears that God is creating civilization on earth even though the Bible doesn’t explicitly say so. How are Jesus and the Holy Spirit involved with creation? Jesus taught his followers by example how to become servant leaders and that is one of the requirements for the creation of a peaceful civilization on earth. Through the Bible and weekly worship services, the Holy Spirit is the unifier gathering the members of Christ’s Team together for team meetings. Is Christ’s Team competing against the teams of other religions? No. There is a section of the last chapter of the book that explores ways that all religions can work together to create better lives for everyone.